The Quartiere Salario is a historic district in Rome brimming with art galleries, concert halls, and parks. Found in the district was a 1950s house with a cramped layout (the typical long-hallway-connecting-a-series-of-small-rooms deal). So Italian architectural studio Strato set out to open up and modernize the space. 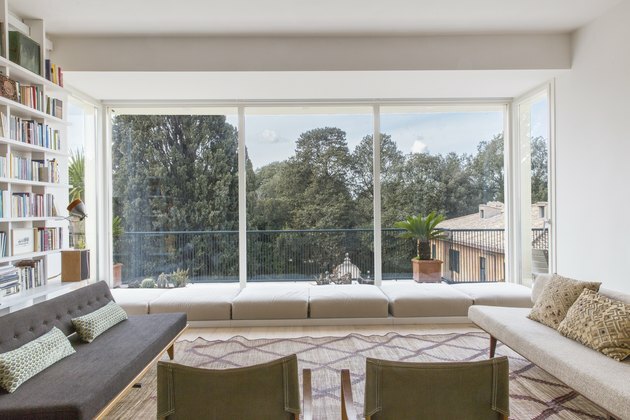 The studio demolished interior walls and switched out narrow windows for larger ones, allowing for views upon views of the Villa Ada park across the street. The designers felt that leaving the "story of the house" was essential to respecting the 2,500-square-foot space's original design, so some features, such as the exposed beams and pillars, remain. 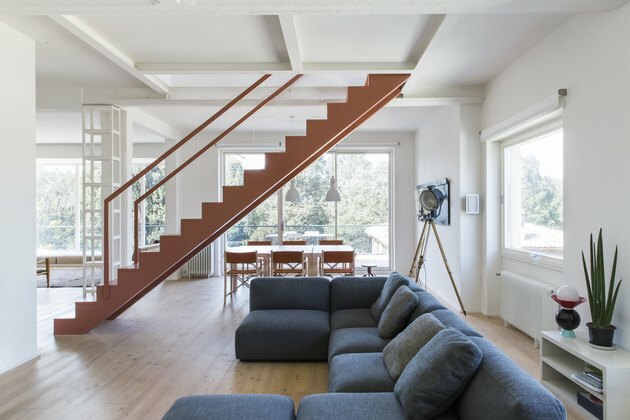 But among the most transformative changes in the three-bedroom, four-bathroom house is a stunning custom-made staircase that was added, which connects the master bedroom to the shared spaces on the lower floor. Read on to learn more about how the authentic midcentury space was transformed into a lighter, brighter home without losing its charm. 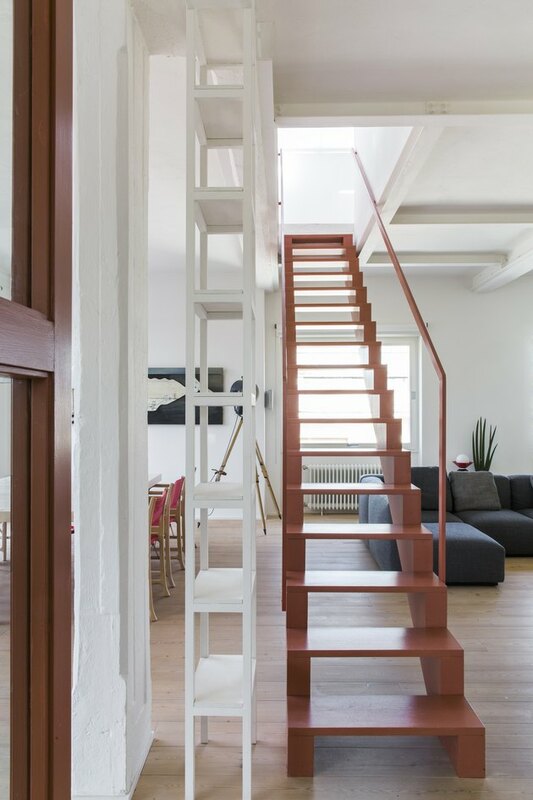 Today, the airy living room has a striking painted wood staircase as its pièce de résistance. As one would hope to find in a home built in the 1950s, there are plenty of midcentury furnishings. Green vintage safari chairs by Carl Hansen & Son are paired with a tan midcentury vintage sofa in the living room, for example. Parquet wood floors are topped with a diamond-pattern traditional Indonesian rug. 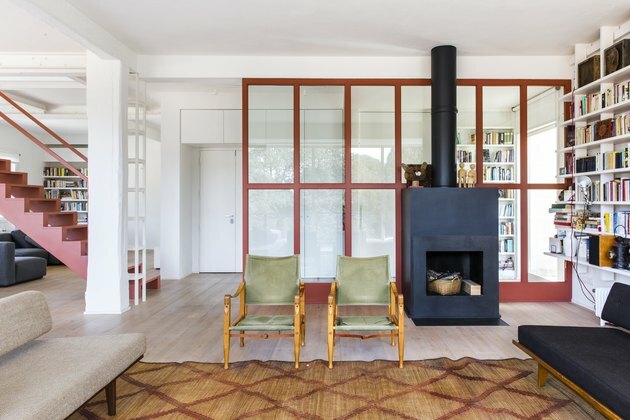 Its deep red tones mimic the painted trim on the room's glass partition. 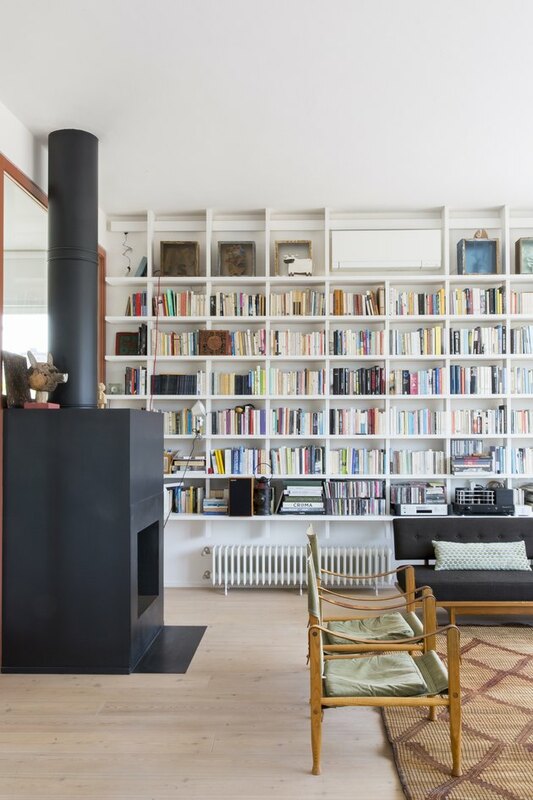 Bring on the custom: Both the fireplace and bookshelves in the living room are originals. 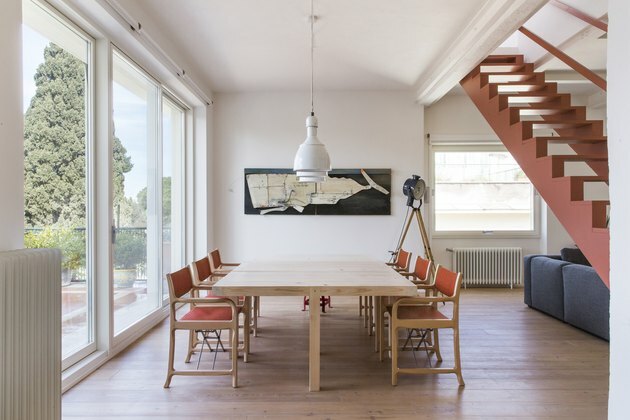 A custom-designed dining table, made from bleached larch, is surrounded by contemporary 298 chairs, which were beautifully designed by Michele De Lucchi for Cassina. The industrial-style ceiling lights were a unique find from 360Volt.com. The paint used on the main living area's walls is Arum by Ressource, and the trim and staircase are drenched in Book Room Red by Farrow & Ball. A custom-made bed is draped in Frette bedding. 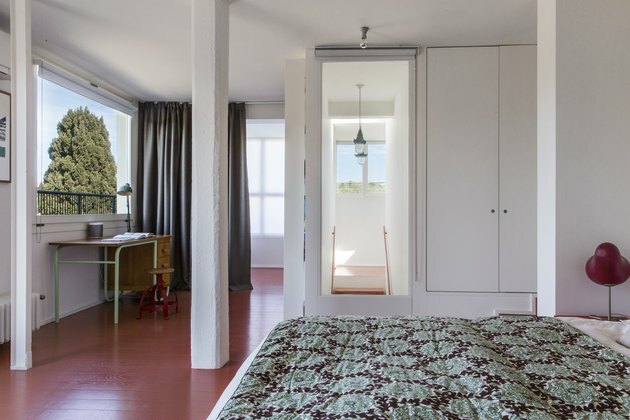 The floors in the bedroom are also painted in Farrow & Ball's terra-cotta shade, Book Room Red. And get this: There's even a reading nook (separated by a curtain). 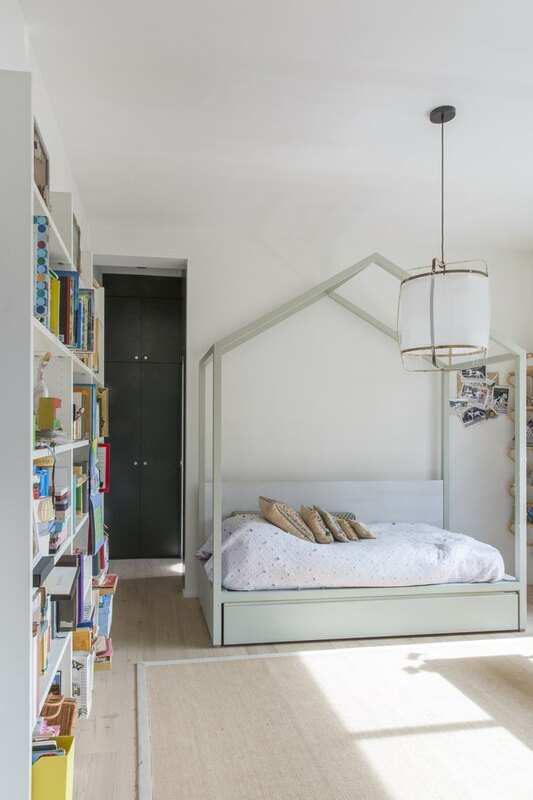 The custom bed in the kids' room is charming thanks to its house-like shape, and the space is finished off with a Z2 Blonde Lamp by AY Illuminate. 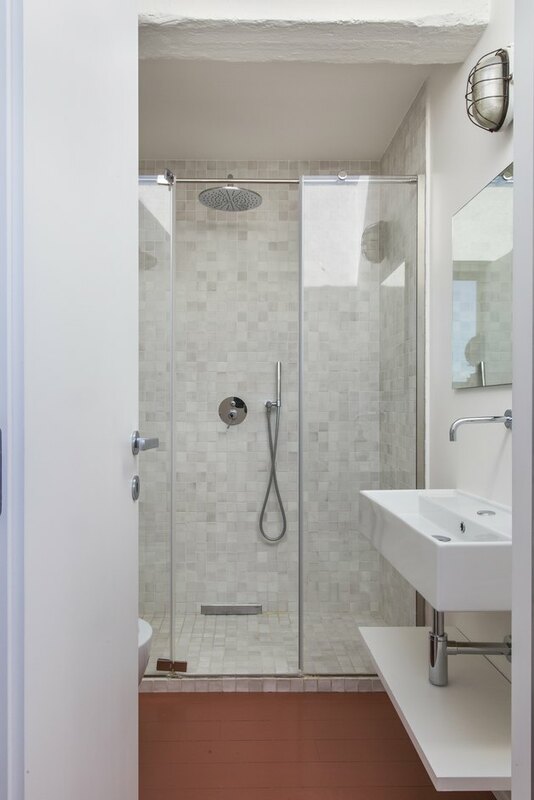 The master bathroom has a Ceramica Flaminia Acquagrande sink with a Bongio T Mix faucet. A vintage industrial lamp — another unique find from 360Volt.com — gives the space a nautical touch. 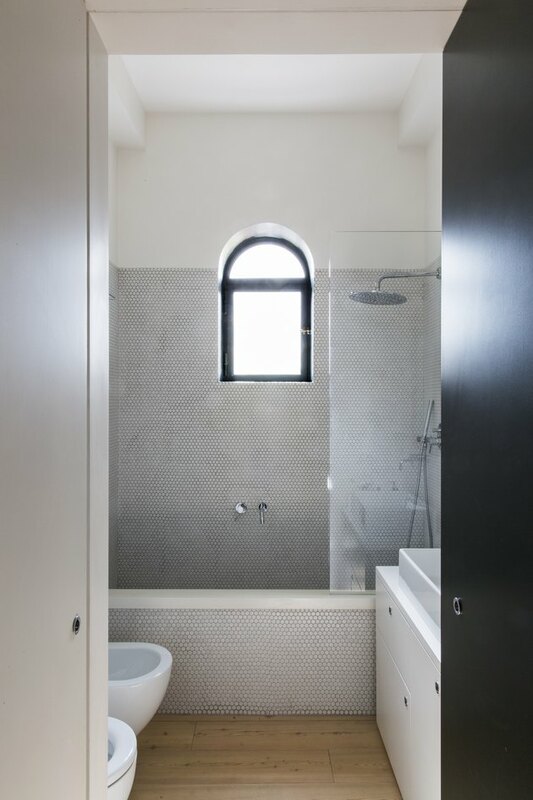 The kids' bedroom's en-suite bathroom offers a bathtub/shower combo decked out in custom-made, hand-painted Fornace Brioni tiles.